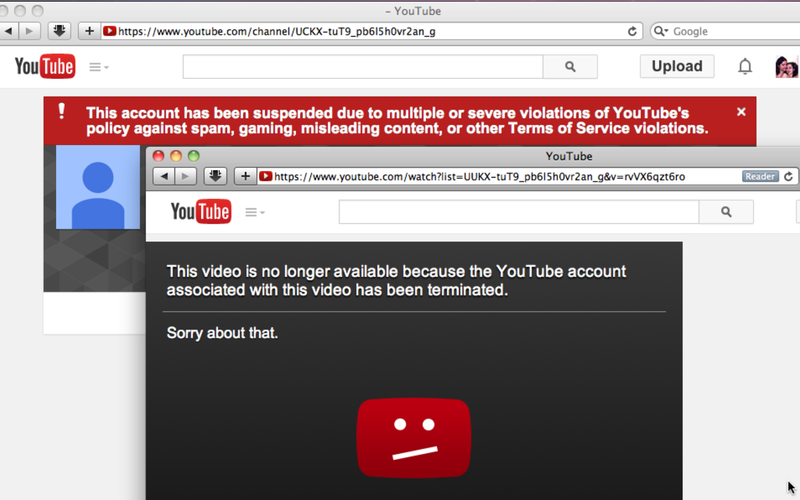 “This account has been suspended due to multiple or severe violations of YouTube’s policy against spam, gaming, misleading content, or other Terms of Service violations.” translation: “it’s our website, we do whatever we want & are accountable to no one.” dishonest, above the law, civil & human rights violation mumbo jumbo illegal precedent. People don’t matter to youtube except for cutthroat elitist oligarchs given everything for nothing but a few selfies, pornstar interviews, pranks or unboxing ®™ trademark © infringement violations. Youtube’s legacy to everyone else is abuse & neglect. More proof in previous blog posts: 10,000+ stolen youtube/georgegodley fullscreen contract youtube videos & stolen geogodley investment account. “On 15-th August 2014 my wife Anna Matskevich was attacked in moscow district Kuzminky by hooligans , who blocked her in post office and called police , which also blowed Anna and forwarded her to the psychiatric clinic with lie accusations. On 19-th August she was brough to so called court hearing under strong psychotropic medicals. My opposing that the staff of the clinic used strong psychotropic medicals before the hearing and that Anna is in the clinic by fabrications by paid liers were ignored by the Judge from local moscow “Lyublinsky” court Mr. Matlachov A.S. , who made decision for forcible treatment of Anna Matskevich in the psychiatry clinic. I visited Anna next day after hearing : she informed me , that it is forbidden for her even to move inside the room ,were she is isolated. It is also vey limited for her just to wash her face , she does not get back her glases , inspite her dioptry is – 8 ! A contacted to her doctor to Mrs. Sevryukova T.A. and pointed on those things asked not to break Anna’s human rights on minimym civilization. On 21-st August I contacted to Deputy chief doctor Mr. Fedin E.Y. He did’nt advice me to make cassation appeal against Anna’s psychiatry imprisonment and allowed only she sign the cassation appeal. The Moscow psychiatry clinic № 13 in soviet time was an instrument of KGB against dissidents. I hope Russia does not turn to that way. Anna before used to do video records in english language on moscow streets , what cased hate of crowd to her , because mostly people don’t understand english, especially west mentality. People in Russia , who use english mostly are lowers or representatives of some west business branches. “Russian Federation recoverd soviet fascistic style of reprisal with otherminded and dissidents. By injection of neuroleptics and tranquilizers during long time it is possible to undermine health and lead a sacrifice to distrophy and death. After this fascism by medical poisoning of Anna Matskevich , she can’t move as she did one month ago. Maybe modern jews have forgotten Hitler’s time ,when a lot of jewish people were put in concentrated camps , where nazis used them for different kind of experiments . Anna Matskevich just wants to be released from these inhuman barbarian experimnets on the personality , dignity , health.